First off, in case you hadn't seen the transformation video, The Curran has been entirely reconfigured for this show, with an elaborate set by Miriam Buether made mostly of plywood — much like a real refugee camp — that takes the orchestra section and turns it into a 360-degree, immersive set with benches and narrow tables. It's meant to be the Afghan Cafe, a fictional amalgam of the multiple restaurants that sprang up in the actual camp this show is based on, The Jungle in Calais, France. Situated in a mud flat beside the entrance to the Channel Tunnel that connects France to the UK, the Calais Jungle was briefly Europe's largest unofficial refugee camp for 18 months between 2015 and 2016, home to some 8,000 people of a broad range of nationalities that included Afghans, Iraqis, Iranians, Syrians, Palestinians, Pakistanis, Kurds, Sudanese, and others. Because of its location and rapidly increasing size, the camp gained international attention as a symbol of the desperation of so many migrants whose only hope was to seek asylum in the UK — where in many cases they already had family. The result is a play of major emotional power and political import. 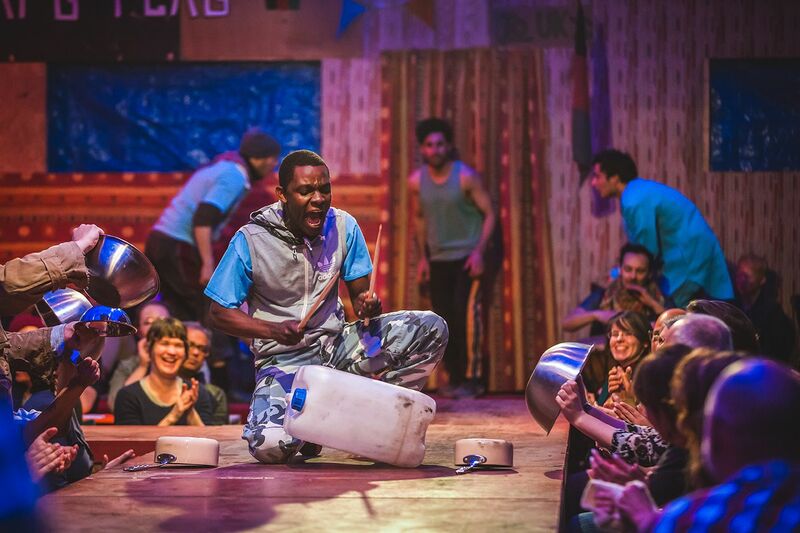 The Jungle succeeds in summoning empathy, over and over, for the real people who arrived and survived in this camp, providing specific stories and relatable situations that hammer the human experience of the Calais Jungle home. It also hammers home the neglected and ignored humanity at the heart of larger geo-political machinations and national attitudes about mass migration. These are just people doing their best to escape tragedy and build new lives, this play seems to be saying, and they left their home countries for all kinds of reasons. Salar seems to be based on an enterprising restaurateur in the real Calais Jungle who won praise in Feb. 2016 from Times of London food critic AA Gill in a bizarre moment of cultural dissonance — and one that highlighted the authentic charms of the spontaneously erected city that the refugee camp had become. "When does a place become a place?" 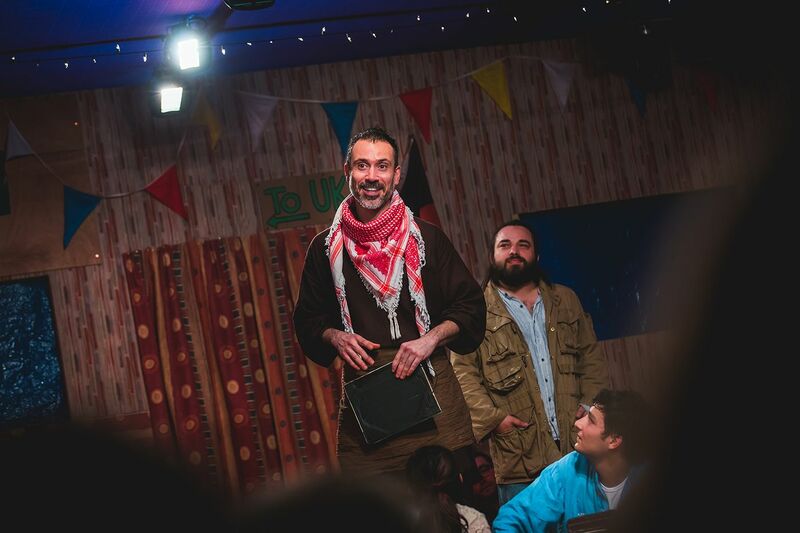 asks Safi (Ammar Haj Ahmad), the narrator of The Jungle who is himself a Syrian migrant desperately hoping for asylum himself after a safe crossing of the English channel. The daily experience of the camp, with its holidays, prayers, nightclubs, spontaneous dances, birthday celebrations, and petty squabbles, is only one thing that The Jungle attempts to immerse us in. There are also the daily anxieties brought by the French government and police attempting to contain the camp's spread and outright evict everyone — the camp, in a smaller form, still exists to this day. And there are the sometimes naive efforts of the British volunteers that run up against the inescapable, ingrained cynicism of the migrants themselves — some of whom, like a Sudanese character named Okot (John Pfumojena) have barely escaped death multiple times. Okot (John Pfumojena) in The JUNGLE. I won't say that the resulting show is going to be easily stomached or enjoyed by every theater-goer. The direction by Stephen Daldry and Justin Martin is loud and confrontational in its storytelling — seating in the mezzanine is probably advised for those who don't want to swivel around to see everything that's happening, or endure the up-close shouting of many characters. It is also incredibly effective in evoking emotion from the audience — to the point that multiple people seated in the front rows could be seen openly weeping during multiple moments. But the performances, across the board, are stellar, including those by Lorraine Bruce as UK volunteer Paula, Rachel Redford as Beth, Trevor Fox as the often inebriated Boxer, and Jonathan Nyati as Mohammed. I can easily say I've never seen a cast of such diversity, with performers hailing from a dozen countries or more — and three of them, Yasin Moradi, Milan Tajmiri, and Mohamed Sarrar, were themselves rufugees living in the camp in Calais just three years ago, before successfully making it to the UK and deciding to join in this theatrical effort to tell the camp's story. A crisis as unruly and complex as the migrant crisis is across Europe — much as it is at our own southern border — requires insistent, claustrophobic, confrontational theater. The Jungle succeeds on those fronts and more. It is a wildly effective piece of political theater while doubling as a touching, funny, eminently watchable piece of documentary stagecraft. It's an experience not likely to be replicated anytime soon, and one that everyone but the faint of heart should see. The Jungle plays through May 19 at The Curran. Find tickets here.